I fell for the Polaroid medium in 2005 and have been smitten ever since. To me, Polaroid differs from ordinary photography, in that it not only conveys the moment captured in the frame, but also a sense of the other life behind and beyond the camera and of the history of the pictures themselves as they voyage through time and space as objects in the physical world; admired and passed around, treasured in wallets, shoved through letterboxes, taped to fridges, then finally lost and forgotten. 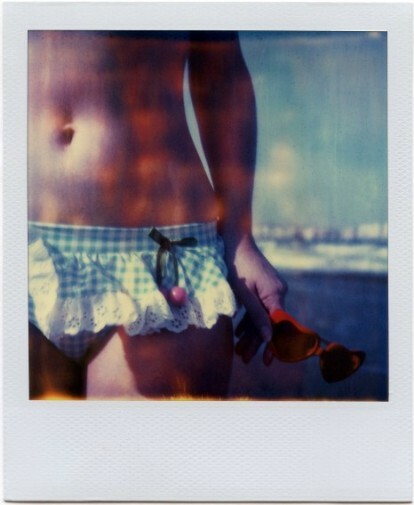 Each Polaroid begins life as a witness to a unique and intimate moment. But as time passes, it collects the telltale traces of many other stories. It is this which makes Polaroid the perfect recording and storytelling medium. My works begin as coded messages: in-jokes between me and a world of friends, lovers, strangers, and - perhaps primarily - between me and my future self. They depict a situation, feeling, observation, thought or idea which gripped me at the time of capture. After that, they embark on a journey. Some I hoard in a shoebox. Others I give away. Some - like the thoughts and feelings that once inspired them - are "lost" when I hide them in hotel rooms, library books or shopping carts, hoping that they will one day present the finder with a small mystery, acting on his or her imagination like a perplexing snippet of overheard conversation. There are too few mysteries in the world.